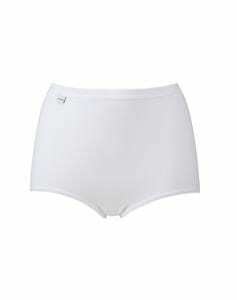 1389100- These 95% cotton maxi briefs from Charnos come in a pack of two for just £10.00. With a high waistband and lower legs for full coverage. Two pair pack of Charnos cotton maxi underwear. In 95% breathable cotton with 3/4 inch elasticated waistband and elasticated cuff legs. These maxi briefs do not have a seam at the front or the back. Thus giving a smooth silhouette beneath light clothing. Furthermore these supersoft knickers are perfect for everyday wear.